WHO DOESN’T LOVE A GOOD MARKET! If you love markets the way I do you might not want to wait for the BIG Fremantle GROWERS GREEN Farmers Market on Sunday, so hop on the train tomorrow to Perth and join me at the SWAN RIVER COMMUNITY MARKETS at Barrack Street, behind the Belltower. It is a great location and there are lots of food and other stalls, live music, and animal touch farm and fairies and face painting for the children. Channel 7 will be filming all morning so this is a good chance of getting your face on TV. We are open from 8-1 on Saturday! Se you there! Comments Off on WHO DOESN’T LOVE A GOOD MARKET! Kaya and G’day! There will be the traditional finish to the annual FREMANTLE FESTIVAL this weekend with the big Festival Parade at 4 pm on Sunday. Expect a huge float from the Perth Freight Link opponents, a lot of music, school kids, fairies, fun floats and political ones and it all ends with a party at Kings Square. On Saturday from 6-9 pm the WARDARNJI ABORIGINAL FESTIVAL will be on at the Fremantle Arts Centre with a lot of music, dancing, bush tucker etc. The event is sponsored by Make Smoking History, so not sure if that means no smoking ceremonies from now on. I am only kidding! It will be moorditj, which is the Whadjuk Nyoongar word for deadly, as in great! I love the Wardarnji and the Parade, so you’ll see me there taking lots of photos. INFILL OR GREAT AUSTRALIAN DREAM? It is interesting to read Fremantle Mayor Brad Pettitt’s call in the media today for the State Government to introduce cut off boundaries for development to stop urban sprawl, which Brad Pettitt says is unsustainable. The WA government already has an infill policy but that is contested at almost every local council. The Cambridge Mayor who supported infill was defeated at the recent local government election by someone strongly opposing it, while the City of Nedlands also believes it should be exempt from infill to preserve it’s character and identity. The Property Council claims that infill development is more expensive and that stops it from building affordable housing in established suburbs. That contradicts what the Fremantle Mayor is claiming about Freo’s inner city development and that “It is about offering real good housing choice.” There is no proof though that Fremantle is doing any better at providing more affordable and social housing than other councils. I agree that urban sprawl is not sustainable, but the Great Australian Dream of a house with garden is still very much alive and part of our culture, so who is going to force people into inner city apartments when most of them are not suitable for families, or for couples who want to have children, and most apartments don’t allow pets either. New development on the periphery should also include medium and high density and not just blocks with single or two-storey homes, as that would start helping reduce the urban sprawl. At the end of the day we are all paying for the infrastructure to the outer suburbs, so maybe people willing to live in inner city apartments should get cheaper housing or rates, or those who want the Great Aussie Dream need to pay a premium to live the dream. I am expecting the Fremantle Mayor to give us a detailed, and hopefully factual, account on how well Freo is doing with affordable housing soon, as he promised to do it by the weekend in response to a previous blog post here earlier this week. It is always good when Fremantle receives positive media coverage but I do agree with former Fremantle Herald and now WA Today reporter Brendan Foster that the placing of Freo as one of the top ten tourism destinations in the world is flabbergasting, and so are some of the other top ten choices. Maybe the Looney, err, Lonely Planet judge enjoyed a bit too much of our great WA wine or readily available dope while here. I love Freo, that’s why I moved here 25 years ago, and my love for this special city has only grown since, but so has my frustration. But is Fremantle a better tourist experience than Berlin, Rome, Barcelona, Prague, Bratislava, Vienna, Amsterdam, Split, Hvar, Paris, the Kimberley, Coral Bay, Hamburg, Vancouver, Leipzig, New York, Venice, Colombo, Bangkok, etc.etc? I think not. But what Fremantle has to offer is special, our Street Art Festival, Blues&Roots, Festival Parade, Blessing of the Fleet, the Bathers Beach Sunset Food Markets and Growers Green Market, the working port, the Swan River and the Indian Ocean, to name just a few. There is enough beauty and quirkiness that makes Freo unique. There is a lot of heritage, lifestyle and character underneath the superficial first impression of a tired uncared for city to make it work for me and many thousands of people who visit each year. 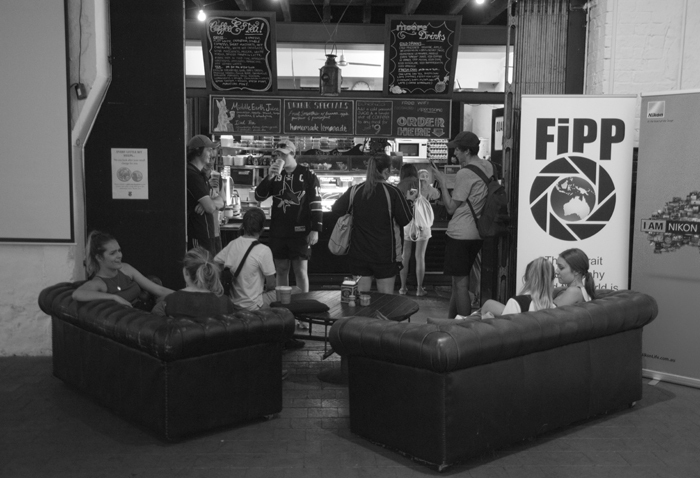 We have Bread in Common, Strange Company, Mojos, The Mantle, Little Creatures, Mrs Brown, Bib&Tucker, the Moore&Moore, PS Art Space, the Fremantle Arts Centre, great beaches to watch kite surfers, and we have that sameness comfort of too many Italian cafes. What we don’t have is cobblestones along High Street west and the Cappuccino Strip, although that would definitely slow down traffic and make the streets look a whole lot better than boring bitumen, and we only have one outstanding modern building in the Maritime Museum. And we have outdated and archaic drinking laws where it is illegal to have a romantic sunset glass of wine with your lover on the beach. The majority of the over 100,000 a year visitors to the Roundhouse tell us guides how special and beautiful Fremantle is and they often compare it with boring Perth, so Freo does well in that comparison, but with all these kind of silly lists of most liveable, most attractive, best tourism cities, etc. it all comes down to personal taste, and that it is impossible to judge what the best tourist destination in the world is. Is wild water rafting in Africa less attractive than swimming with the whales at Coral Bay, is experiencing the silent beauty of the Bungles better than the great historic feel of ancient cities? Who would want to be a judge on that? What Lonely Planet did is basically the same silliness as those who claim Australia is the best place on earth. There is not such a thing as the best place, or best person, best artist, as it is all very subjective and comes down to personal taste. I want Fremantle to be attractive to tourists, but I don’t want it to become one of the major tourist destinations in the world because tourism kills local character, as we can witness in Bali and all over the world. Freo is just Freo. Individual, unique, untidy, irreverent, far from perfect, very loveable and extremely annoying. It’s the place where I want to live till I die. For all you dog lovers out there the Scruffs Dog Show at Fremantle’s Wilson Park at South Beach this Saturday will be heaven. 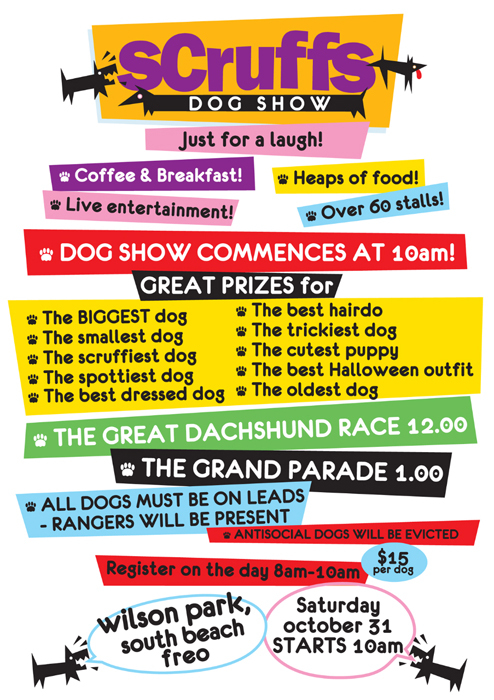 There will be over sixty stalls, including food stalls for breaky and lunch, a dachshund race, prizes for the biggest dog, the smallest dog, etc. It starts at 10 am and dogs need to be on leads and well behaved in a crowd of people and dogs. 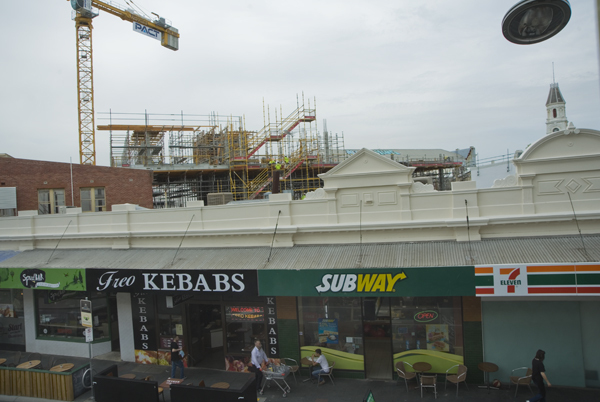 The Atwell Arcade development in inner city Fremantle is going up very fast and is now sticking out above the buildings at Market Street. The estimated time of completion is around April so only six more months to go till we’ll see people moving into the offices and hopefully a good new retailer at ground level. The WA State Government has appointed a consortium to build the $ 500 million Roe 8 highway extension, which is part of the proposed Perth Freight Link. The consortium is made up of Leighton Contractors, Georgiou, GHD, AECOM, WA Limestone and BG&E. It is the same consortium that is building the Gateway WA project around Perth Airport. The government says it will create 600 jobs and came in under budget, and that the project will include an innovative road layout at the Kwinana/Roe highways interchange. The wait is now on to see if engineers and planners can find a decent solution to actually finish the PFL into Fremantle Ports without destroying North Fremantle and parts of East Fremantle, Hamilton Hill, Beaconsfield and White Gum Valley. LONELY PLANET has elected Fremantle as one of its ten best tourism destinations in the world, writing that in 2016 Freo is a thriving urban culture with a string of awesome arts events that celebrate the city’s essence. According to Lonely Planet Fremantle is “a raffish harbour town with a sea-salty soul to burn.” and that “Fremantle thrums with live music rooms, hipster bars, boutique hotels, left-field bookshops, craft beer breweries, Indian Ocean seafood shacks, buskers, beaches and students on the run from books. It is a nice compliment for Fremantle that hopefully will encourage the City to do more for tourism by making way finding easier with more signs and information available. While one never should put all of one’s eggs in one basket I strongly believe the City of Fremantle should more passionately embrace tourism, nurture the heritage aspects of our city, improve our beaches with better toilets, shade structures, etc. and have multi-lingual touch screens around town so that language barriers can be removed. Here some more impressions of Saturday’s SWAN RIVER COMMUNITY MARKETS at Elizabeth Quay/Barrack Street jetty in Perth, that is being organised by Fremantle’s Kylie Wheatley of Red Tent Events fame, and that I am also involved with. The market has huge potential in my opinion once the Elizabeth Quay building site is finished. I believe the official opening of that will be around Christmas time this year, so only two months away. It is a very impressive development that could well become a major tourist attraction. Go and see for yourself. The markets are on Saturdays from 8 am to 1pm. WILL SUN SET ON ARTHUR HEAD CONCERT PROPOSAL? The temporary two-year live music events proposal at historic Arthur Head by Sunset Events depends very much on Fremantle Ports. The West Australian reports today that the organisers have met with Port management to iron out details and to see if FP would grant them access to Fleet Street for deliveries. The latest info is that the first event planned is a two-day concert on the Australia Day long weekend on the 24th and 25th of January, so that would be a good test to see what works and what doesn’t, and how/if it will effect the West End of Fremantle with noise, parking and anti-social behaviour issues. There are also serious concerns about the effect live concerts could have on the tourist operation of the Roundhouse and on the many weekend weddings in the area. I need to stress though that my concerns are not with Sunset Events, who are very good event organisers. I like the Blues&Roots and Laneway festivals and I hope the Drillhall-former Fly by Night- will become and outstanding music venue for Fremantle, but in my opinion Arthur Head is just not the right location for live outdoor concerts. I still believe Fremantle Council made the wrong decision recommending approval of the project to the WA Planning Commission and I hope the proposal will be stopped by the WAPC because of the concerns of heritage groups, residents, Fremantle Ports and others. 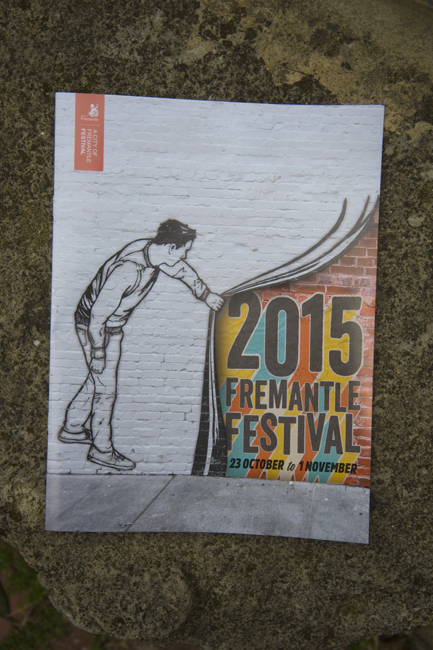 76 out of 78 submissions to the City of Fremantle were against the proposal!